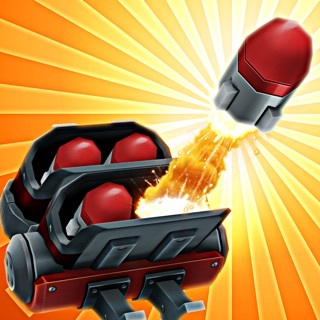 Calling all strategic tower defenders! 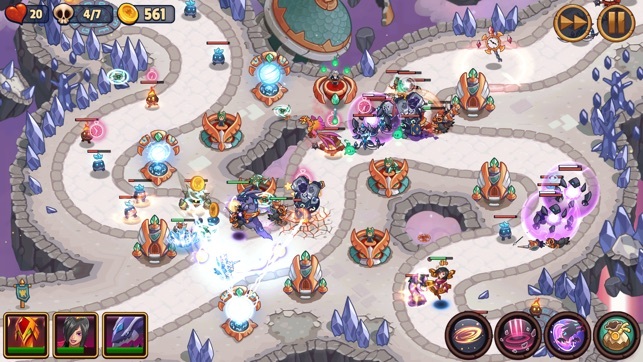 Are you a fan of epic online tower defense games? Download now to join fantasy heroes like Smoulder the Dragon and many others in their ongoing quest to defend the realm! Will you help our heroes save the turrets and towers from invasion? Do you have what it takes to engage in realm defense? 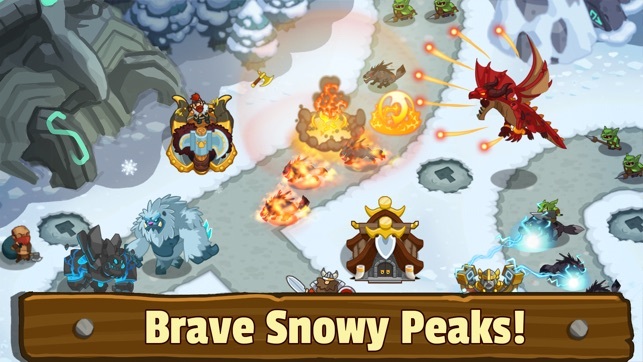 This real-time kingdom rush castle defense game needs your help to battle and conquer! We need your skills to defend the tower – The Allied Kingdoms have one choice in this TD game: defend, defend, defend! Battle with Death Knights and fight alongside dragons, wizards, ice queens, knights and other ancient gods in our magical fantasy adventure field! You can acquire gems, potions, elixir, and even spells while working your way up to become a champion and hero! Are you ready to save the kingdom and be the best realm grinder out there? Realm Defense is an ultimate tower kingdom defense game that challenges skilled players like you! Use our huge variety of powers and abilities to overcome obstacles in over 300 levels. 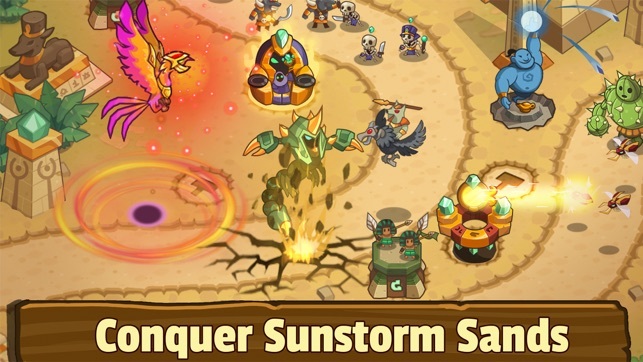 By being a part of our kingdom rush frontier, you will travel through lush forests, snow covered mountains, and epic deserts as you use YOUR strategy to face off against enemies! The opportunities are endless – YOU will oversee the building a heroic team, discovering secret challenges, and upgrading your towers! Deploy rapid-fire archers! Carve walls on the map with magic beams! Fire roaring cannons! Summon allies! Realm Defense offers variety and challenge. Overcome incredible odds with strategy and wit! 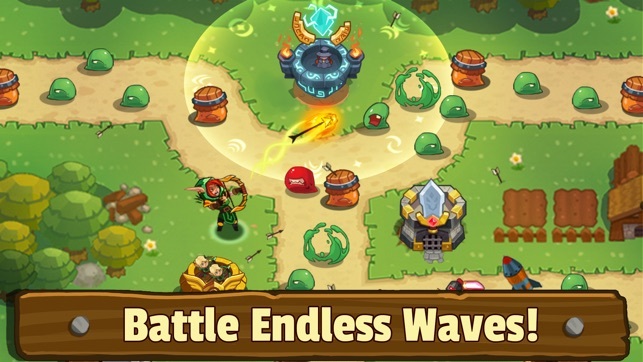 Rescue helpless villagers, collect important resources, and recruit legendary heroes with deadly abilities along the way to stop evil in this standout tower defense game. PLEASE NOTE! 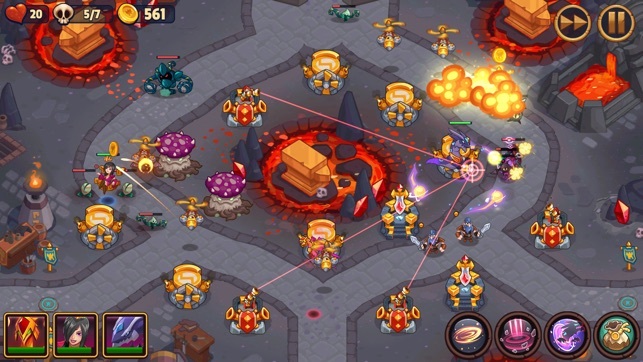 This online game is free to play and made by people who love tower defense games. We sincerely hope you enjoy our work! Overall as far as good tower defense games go I really enjoy playing this! Although it’s not my favorite type of TD (i prefer ones you build mazes with your towers) Got it when it only had one world and have been playing every now and again since! Never needed to spend any money on it and have all but one hero that was just released and this is a really good game with constant updates and support. The team working on this game has been fantastic and constantly delivered! Only thing I have a complaint about is the balancing of hero’s. There’s really no point to using more than half of the hero’s because the balancing is just really bad (although they are the cheap ones) the new hero’s typically are always better than any old ones even though the abilities are vastly different. They Need to work on how to balance some things so that certain hero’s actually give you a strategy. Why waste time on the awaking tokens for older hero’s? When the new hero’s cost the same amount of gems basically and automatically are better. This is apparent in the tournament mode where you can see everyone in the top 10 uses the same hero set. This is by far one of my favorite games. I used to be so bored in study hall because eventually the no-internet app games get old. When I started playing this I was surprised by how fast time went by. I play it in my free time too now and love it especially because of the heroes you can get that really add to the tower defense basis. I don’t spend any real money on items or heroes and find that it is still just as fun. If you take the time to work at the levels and level up your heroes, try new strategies, and check the box for what other people suggested then it’s no problem. No money needed. I am a bit over halfway through world 2 so maybe I might change my view on not spending money later on when it gets harder or I have to unlock other worlds but for now I love this game a lot and I still will even if I need to spend some money eventually. You can always get heroes for gems and right now I don’t see them cornering me into buying something with real money which is great. Also it doesn’t inundate me with ads which is another plus. Five stars, no doubt. Was a fun game for a day or two. Pretty disappointed how many hoops you have to jump through to just progress to world 3. Most games you finish a level and move on to the next...not this one. I guess you have spend some money and hope it’s worth it. It’s still unclear what exactly I need to move on. I need to clear S9 to upgrade the first skill of my hero and have to wait 24 hours after beating one stage until the next is available. So 8 days total it will take me to upgrade one ability. You can’t even rush the process with gems. Why the F would anyone spend money on this game?? I cleared everything on world 1 and 2 legendary mode in like 2 days with the two 1500 gem heroes so what incentive do I have spend 3k each on two more? I get to move to the next level, and have another 2 days worth of content. I downloaded this game like a week or week and a half ago. I log in once or twice a day to collect my elixir and do shattered realms and the daily etc. like 10 minutes of content a day. And when I do, I have the option to skip battle with an ad. That’s annoying.